Last weekend, MMO ATK visited WonderCon Anaheim 2013. We had lots of fun and saw some amazing costumes. A majority of the costumes were obviously superheroes from DC and Marvel comics. There was so much comic book madness going around that we even snagged a shot of the creator of most of those superheroes, Stan Lee. With Ironman 3 being released in under a month a Injustice: Gods Among Us hitting stores in just a week; what could be more fitting then ranking 10 amazing superhero games in the MMO genre? If you?ve seen our MMO ATK Top 10 videos, you were probably expecting this one. Marvel Avengers Alliance is a social game playable through Facebook. This turn based MMORPG has been a success ever since its release and it?s slowly climbing the charts. For now there?s just not enough action to push it past the other superhero options ahead. The storyline is also very limited and linear, so all the enjoyment comes from the battles. No one expected this MMO to take off. Still, the game continues to improve it?s all star cast of Marvel characters. Give the game some time to evolve though. Who knows where it will stand against other superhero titles in the end? Cue the clich? of sounding old, because kids nowadays just don?t know how good they have it. Super Hero Squad Online is another MMO game aimed toward a younger crowd. This superhero game throws players into the wonderful world of Marvel, where they can play as some of their favorite characters. The game is free to play but does support a monthly subscription model that provides more content for the player. Super Hero Squad Online is easy to learn but a fun choice for fans looking to satisfy their cartoon and comic book addictions until the release of Marvel Heroes. Don?t expect this titles to get stale anytime soon either. Developers continue to improve the game by adding new events that alter the MMO universe. You may need to shell out some dough to grab the specific superhero you always look forward too (sorry Iron Man fans). One thing?s for sure though. The addition of Mayhem Mode brought an influx of infamous Marvel baddies, making up one of the best character arsenals of any superhero game available. What time is it? Adventure Time! Well it is if you choose Finn in this wonderful MMO game. This MMOTPS has been able to grow because of it?s availability on both PC and Mac. FusionFall was released by Cartoon Network to provide an MMO experience for their young fan base. Many gamers are kids at heart though, so don?t let age deter you from this unique, free to play experience. The superheroes in FusionFall may not have spawned from the brilliant minds at DC and Marvel, but there?s no doubt many could contend. After all, sugar, spice, and everything nice sure packs one hell of a punch when mixed with chemical X. Don?t worry though, the Powerpuff girls aren?t the extent of heroism in FusionFall. Thanks to a brilliant update to the game just weeks ago, players can now even play as Dexter?s favorite superhero, Major Glory. Fans of old and new cartoon network programs will be able enjoy this browser based wonder on Mac, Linux, and PC. It?s understandable if you still have your doubts about this MMOTPS. Still, we mentioned this game delivers the endless heroics of adventure junkie, Finn the Human. It also brings the magical shape shifting powers of his companion, Jake the Dog. How much more of a super heroic combo can you really get then those two life savers? Deadpool fans that enjoy an onslaught of bad puns will enjoy this free browser MMORPG. Like FusionFall, Hero Smash is a cartoon inspired MMO game with no downloading required. Players can look forward to the typical RPG qualities such as customization over your character. Here players will choose and combine a number of different super powers on their journey to becoming a famous hero, or an infamous villain. Anyone looking for a comic-book style storyline or 60?s Batman type dialogue will be satisfied with this MMO. It even offers 100% more PvP (whatever that means)! The clear focus is on the uniqueness of your character, but there are obvious experiences to look forward to where you can test those powers. Optional PvP and cooperative support through real time battle experiences help bring together players of all ages. This title is just taking off too. Developers are promising tons of future content, including secret identities for your character and maybe even a fortress of solitude style lair to return to. The biggest draw about this MMORPGs youth is that developers are still improving it, meaning it will only get better. There is so much more to come that developers are even promising to transition certain dedicated players into official game characters. There aren?t many MMOs out there that offer such levels of possible gaming immortality. The game may have player limits like Team Fortress 2, but a persistent stat system and customizable character base makes Gotham City Impostors a wonderful online multiplayer experience for fans of the FPS genre. Downloadable on PS3, Xbox, and PC; players will choose the moral path of their character by picking a freelance vigilante or psychopathic criminal in the city of Gotham. Whether it?s grappling hooks or carnival explosive that you favor, this game finds a great way of wrapping up customizable costumes and zany gadgets all in one suitable character. The online FPS is basically Call of Duty with Batman characters, but is that really a bad thing? Fans of the dark knight can take part in the classic Team Deathmatch but also partake in crazy multiplayer modes like Psych Warfare, Bounty Hunter, and Fumigation. With insane game types, Batman and Joker inspired fighters, and a barrage of weaponry for characters to build on; Gotham City Impostors delivers a unique twist on the run of the mill superhero game. This MMO is only available on the PC but has surely gained solid following since its creation. Champions Online is heavily action oriented and designed by the same lead developer as City of Heroes. The previous title was so popular though that Champions Online hasn?t been able to live up to fan expectations. The graphics are definitely better, but the newer MMORPG fails to reach out to the average gamer. User interface isn?t too friendly, and there isn?t much variety in free content. If you stick with the game long enough to want to subscribe though, you will be playing one of the better superhero MMOs out there. Players will see more skills available than in other MMOs. Another twist on classic MMORPGs is that Champions Online doesn?t provide an armor system by making all gear more of a cosmetic choice, which at the very least puts an end to everyone wearing the same things. Most people already consider this game one of the best MMO choices for superhero fans. One thing?s for sure though; if there was no City of Heroes to set such a high standard in the first place, there would be no arguing the success of Champions Online. Another wonder from the creative developers at Carbine Studios, Infinite Crisis is promising to be the best superhero themed MOBA ever created. The game may provide some of the best characters the DC multiverse has to offer, but that?s been done before. Turbine is dedicated to expanding the MOBA gaming with their title, so fans of MOBA style games have something to look forward to regardless of the all star cast that?s sure to be available. A recent trailer of the game confirmed favorites like Wonder Woman and new creations like Nightmare Batman. There will be alternate versions of other champions too, and it?s pretty clear they will be satisfying arrivals. Infinite Crisis promises a rare interactive quality, giving players the right to alter environments and scenery by utilizing certain powers. Infinite Crisis has a free to play model that supports the purchasing of artifacts. The game steers players in the right direction when making purchases too, so don?t fear the classic case of wasting your money on the wrong item. You also gain gold based on the amount of hits your character lands in battle, rather than just defeating an enemy. Obviously some characters will be more Bruce Wayne then they are Batman in the end, but it?s nice to see reciprocity for contribution. The most rewarding quality of Infinite Crisis is building up your character to achieve unique powers. The more dedicated you are to one champion, the faster you will achieve an advanced super power. Players can start signing up for the beta immediately as the game is expected to launch in 2013. With an increased MOBA popularity, a huge superhero fan base stuck on DC Universe Online, and developers that brought you MMO greats like Lord of the Rings; Infinite Crisis is surely destined for something great. If Marvel Super Hero Squad seemed too childish to you, rest assured there?s going to be a much better option. Infinite Crisis would have been the most anticipated superhero MMO this year if it wasn?t for the impending competition of the MMORPG Marvel Heroes. The game is ready to go free to play upon release, with obvious inclusion of microtransactions. This MMORPG presents a great mix of single player storyline and multiplayer interaction. If you are looking for something that will bring the future of Marvel superheroes into the MMO community, this is the game that?s going to do it. With gameplay qualities reminiscent of days spent playing Diablo II, there is a huge community just dying for an improvement in the genre (especially with the epic let down of Diablo 3). People have already latched onto the project by partaking in the Marvel Heroes Founders Program. The program gives unlimited access to character packs that in the future will only be purchasable or worse, never available again. IGN is hosting an open beta run this weekend for people to join, but everyone will have access to the game on June 4th, when it?s released. Whether you plan to enjoy a traditional Spider-man verse Venom showdown, or undertake lesser known characters like Rocket Racoon and Living Laser, this is the game every Marvel fan?s been waiting for. We’ve placed DC Universe high on our top 10 lists before, so it’s number two ranking shouldn’t be a surprise when it comes to superheroes. The most crucial aspect of this games greatness is the comic book feel players get through storyline cut scenes. Paid legendary subscriptions bring a plethora of additional content, but players can look forward to most of this great title for free. If you are looking for an MMO that’s new and original but plays like a game you’ve experienced before, DC Universe Online is the choice to go with, even for non superhero fans. The action oriented style keeps player feeling involved, and an immersive environment delivers realistic recreations of famous comic book locations. Voice over content brings the gaming experience to the next level by providing characters with a variety of realistic personalities are reactions. This is crucial component and brilliant idea that ultimately solidified an all around successful MMO. When you are learning from psychopathic mentors like Joker or morally conflicting vigilantes like Batman, verbal interaction goes a long way. A mix of fantastic PvP and rewarding PvE scenarios provide the most satisfying superhero MMORPG currently available. There aren?t many MMO games that can live up to the success of City of Heroes, mainly because it has officially ended and can never go downhill. Yes, sadly you can?t play one of the best superhero MMOs ever created . . . for now. 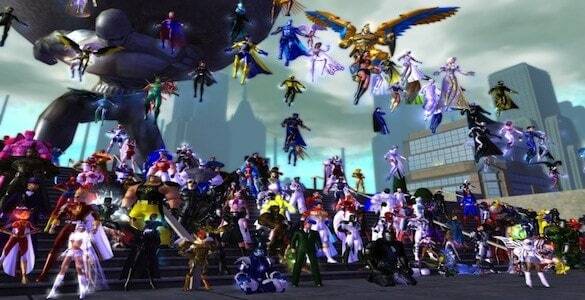 The game was so popular that fans are coming together across the world to develop a replica version of the brilliant wonder that was a City of Heroes. Years ago, people wouldn?t waste there time on thinking such endeavors could ever emulate such MMO greatness. The world is different now though. With the introduction of funding through Kickstarter and the biggest fan base of any superhero MMO, it may actually happen. In fact the creative movement already has two life forces behind it, called Phoenix Project and Heroes and Villains. Most games die out for years, with some never being remade. With two support networks after just months of cancellation though, City of Heroes might be the best superhero MMO ever. City of Heroes spanned over 8 years, bringing insane amounts of end game content. This MMO gave people something to look forward to right from the get go, and that never ended. The combat system could be broken, but that just made it more fun for some people. Character customization in City of Heroes was extremely in depth, even more than the innovative MMORPGs being released years after it. If you wanted a place to make a unique superhero and not just a reused Marvel and DC character, this was the place to do it. With the MMO world exploding since the game?s launch, it managed to improve and keep up with all of its competition. With a free to play model eventually making its way into the amazing MMO, it makes perfect sense why superhero fans are outraged at its disappearance. When the only thing stopping a game from existing is the company that made it, what better justifies it to be at the top of any superhero game list.